COMMUNITY SERVICE: FOR THE PAST THREE YEARS, HALF-MARATHON WALK FOR THE “JIMMY FUND” AND “DANA FARBER” CANCER INSTITUTE. WORKS WITH “SILVER CROSS SOCIETY” AT ST. BERNARD, WORKING MASSES OPEN HOUSES AND OTHER EVENTS. NAMED ALL-STATE PLAYER IN 2018. ALSO PLAYS HIGH SCHOOL VARSITY SOCCER AND BASKETBALL. THE BUZZ: PLAYING IN THE FALL AND BEGINNING HER INAUGURAL SEASON WITH STING 16U, BRI PROVED TO BE A GREAT, ATHLETIC AND SMART CATCHER. 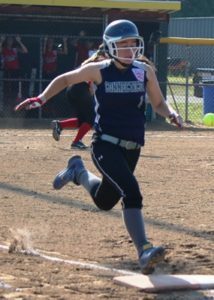 HER SPEED AND QUICKNESS ALLOWS HER TO COVER MAXIMUM GROUND IN CENTERFIELD. AT THE PLATE, SHE IS A DYNAMIC, CONSISTENT HITTER, WITH POWER TO BOTH GAPS. ON THE BASES, SHES A THREAT TO STEAL AND REGULARLY TURNS DOUBLES INTO TRIPLES. ANY COACH WITH INTEREST IN BRI IS ENCOURAGED TO CONTACT US.